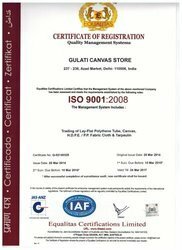 Incepted in the year 1994, we Gulati Canvas Store have established ourselves as one of the reputed manufacturers and traders of Tarpulins and Polythene Tubes in India. With our huge collection of different types of covering materials, we cater to the changing and demanding requirements of various industries in the country ensuring their product safety. We also offer our clients with impeccable packaging solutions that remove the glitches in packaging and enable them offer their products in classy as well as stylish looks. Our company leverages on state-of-the-art infrastructure facility that is spread across a huge area and comprises production unit, quality control unit, research & development unit, and warehousing unit. All these units are managed by experienced personnel who enable us offer an immaculate range of packaging materials to the clients. These personnel work with professionalism and dedication in order to achieve ultimate customer satisfaction. With the support of these personnel, we also offer our clients with innovative solutions with the help of quality graphic impression to make the packaging attractive to the end consumer. We are an ISO 9001:2008 Certified organization and ensure all the products delivered to customers are flawess and result oriented. Our Proprietor, Mr. Ajay Gulati is one inspirational person in the organization. He brings in years of experience from this domain, which guides our team to perform in a best manner. Under his guidance, our team has not only grown in stature but also gained the expertise to understand the critical clients' requirements and offer them unmatched packaging solutions. Moreover, owing to these attributes, we have acquired a huge client base from across the country. We have set-up an advanced Research & Development Unit that works on bringing in technical advancements in our production processes. This unit also facilitates us in coming up with innovative ideas and solutions that enable us sustain the market pressures and stay ahead of our competitors. Our researchers also enable us upgrade our production unit and quality checking procedures on a regular interval. This ensures us that we offer an unmatched range to the clients and also to set benchmarks for our competitors. We are one of the reputed manufacturers and traders of covering materials Like Tarpaulins and Polythene Tubes in India. These products are manufactured in compliance with the required industry standards using quality materials. We also make use of precision production techniques to offer these products in various specifications to meet the requirements of our esteemed clients.